Blog site for whisky reviews and more ! Last Friday I went to an all Arran tasting, what the heck, I was the organiser (with some help from DH17) of this tasting. For me it was the first time to host an event and it won’t be the last. The tasting was part of a “Getting to know each other” event for the newly founded Whiskyclub Bergen op Zoom (working title). The founder, hmmmm….. Well it is me! The evening was a great success, thirty enthusiasts came for the presentation of the plans and off course for the whisky, at the start of the evening there were 2 members, at the end there were 26, so it was a great success. But this is not the purpose of this blog so let us talk whisky. 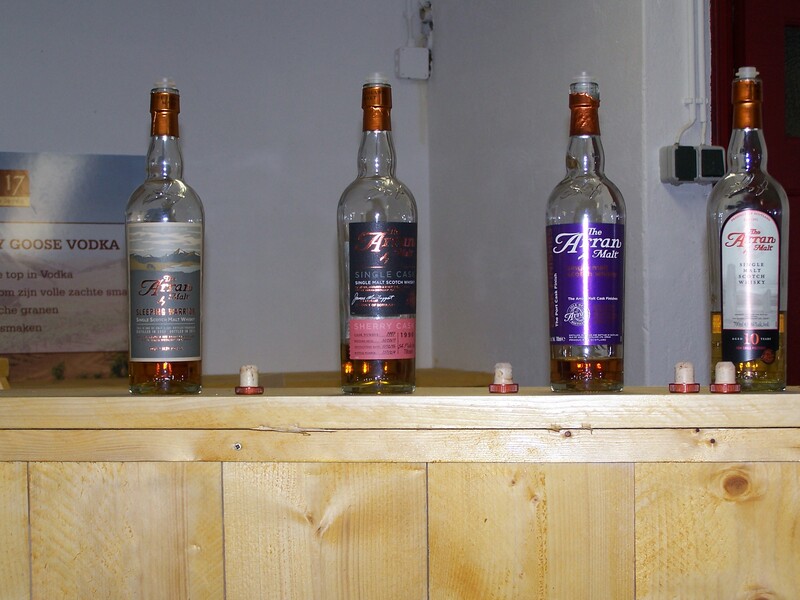 As stated it was an all Arran Tasting, the line-up consist of four whiskies out of the four core ranges of Arran, but as I was hosting the event my notes are quite short. The glasses used were Glen Cairn Small Glasses. There are many rumours about the Cask Finishes Range of Arran and they aren’t usually that well. Colour a nice mid amber with a red glow. Difficult nose, but a distinct fortified wine smell is coming out. After a minute or so there will fruit on the nose, but the kind you will find in Marmalade, sweet, citrusy somewhat lemongrass. Taste somewhat sweet on its own not very great. Finish again quite short. I guess the best way to enjoy this is as an after dinner dram with some nice, in taste quite powerful cheese to accompanied with. No winner for me! The newest ones in the range of Single Cask. Wow this is different, a beautiful sherried nose appears and I liked it very much. The dried fruits, but also the freshness of the 10 year old are greatly balanced in this dram. The velvety mouth feel and the nutty flavours are definitely of my liking. Needs a revisit soon (I have a leftover of this one), so there will be a follow-up on this one! Well the Port Cask is the resonant in this line-up, the 10 nice summer dram, not too simple and needs time. Then the last two, they are mature, full bodied and balanced drams of this young distillery. The winner for me is the Premium Cask closely followed by the Sleeping Warrior. Whisky enthousiast. Loves Whisky, Wine, Music and a good meal. This entry was posted in Island notes, Isle of Arran, Whisky tastings/festivals and tagged 10yo, Arran, Port Cask, Premium Cask 1996, Sleeping Warrior, Tasting note, whisky. Bookmark the permalink.